Life is Marketing: Apple's iPhone Now in Hand, But How Big a Hand? 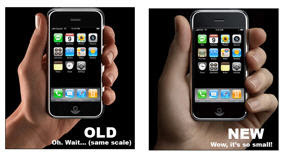 Further proof that no detail is too small to worry about... Apple has obviously put great thought into the size of their hand models. Check out these early shots as compared with the later shots: Nope, the phone didn't change size, but it sure looks like it did. Strangest thing is, it really does make a difference in how you think about the phone, doesn't it? Credit to Boing Boing for finding this.